This example will Blackout the New Years day when the Datepicker Options plugin is used. By default, the month and year are displayed in dropdown lists. 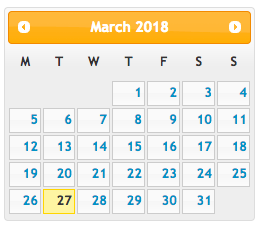 By using this code, it will allow you to show the month and year in the calendar display header and have users select dates by using the next/previous buttons. This example adds a clickable calendar icon next to a date field. When the icon is clicked, it will pull up the calendar. It is recommended to move the icon image to your site's images folder and adjust the path in the code. You can change the icon to any image in your site's images folder.